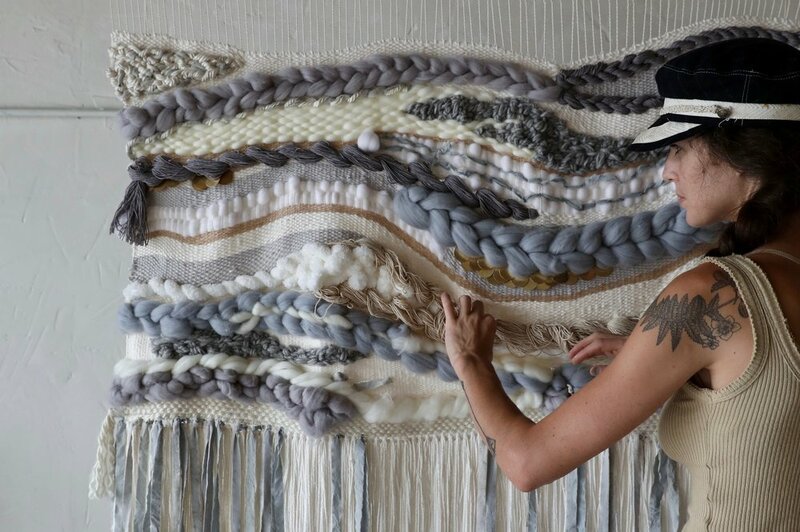 Feed Weave is an initiative started by Maggie Pate that used food waste strictly as the dye material in large scale fiber installations as well as accessible small weavings for the home. These weavings aim to explore the cross-section where food and slow craft intersect. In America 40% of food produced is thrown out to landfills. Food waste is an epidemic contributing to starvation and environmental degradation. Feed Weave forces an audience to see beauty in trash and food scraps as delicate blush tones emerge from a handful of avocado pits, water-soaked black beans release an ashy blue hue, and fennel feathers morph into an icy mint. All of food waste for these pieces are collected from restaurants and local farms. Our hope for this initiative is that the hues rendered from food waste will challenge people to experience food in a new way as well as urge others to reconnect with their own personal narrative of the food sustainability and the history of slow craft textiles. In addition, for every Feed Weave piece sold 10% of the price is given to non-profits fighting food waste or local community kitchens to feed the hungry. Feed Weave pieces are available as commissions specifically. Restaurants & Chefs are encouraged to contact Maggie about fiber installations or weavings exclusively using their kitchen food waste. Such pieces are kaleidoscopes of color unique to the ingredients used in their dishes.